The following events related to coins and coin collecting will take place during the month of November 2010. The schedule for the month is packed with three different coin shows, two coin launch ceremonies hosted by the US Mint, and a flurry of new US Mint products. The month begins with the Whitman Coin & Collectibles Expo held in Baltimore, Maryland. Grading firms PCGS and NGC will both be available at the show for on-site grading. The official auction for the show will be held by Bowers and Merena. Later in the month, the Santa Clara Coin Expo will be held in California with an official auction from Teletrade. The circulation release dates for the final issues of the this year for the America the Beautiful Quarters Program and Presidential Dollar Program will take place this month. The Abraham Lincoln Dollar is expected to generate some attention for the dollar coin series, with a launch ceremony planned at President Lincoln’s Cottage. 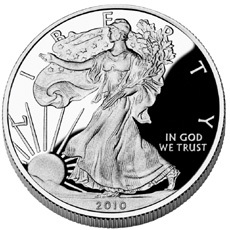 United States Mint product releases will be highlighted by the 2010 Proof Silver Eagle. Last year the popular collector offering was canceled, adding some pent up demand an enthusiasm for this year’s offering. Three new product types for the America the Beautiful Quarters Program will also be released during the month. Whitman Coin & Collectibles Expo held at Baltimore Convention Center in Baltimore, Maryland. Numismata Frankfurt held in Exhibition Centre Frankfurt in Frankfurt, Germany. 2010 Mount Hood National Forest Quarter released into circulation. Mount Hood Quarters bags and rolls on sale at the US Mint. Santa Clara Coin Expo held at the Santa Clara Convention Center in Santa Clara, California. Mount Hood Quarter Launch Ceremony held at the World Forestry Center, 4033 SW Canyon Road, Portland, Oregon. 2010 Hot Springs Quarter Three Coin Set on sale at the US Mint. 2010 Abraham Lincoln Presidential Dollar released into circulation. Abraham Lincoln Dollars bags and rolls on sale at the US Mint. Abraham Lincoln Dollar Launch Ceremony held at President Lincoln’s Cottage on the grounds of the Armed Foreces Retirement Home in Washington, D.C.
2010 Proof American Silver Eagle on sale at the US Mint. 2010 America the Beautiful Quarters Circulating Coin Set on sale at the US Mint. 2010 America the Beautiful Quarters Uncirculated Coin Set on sale at the US Mint.